Researchers of German security firm G Data have discovered that a bot builder dubbed "Aldi Bot" is currently being offered for that much on underground forums. The Aldi Bot Builder appears to be based on the ZeuS source code. The malware has nothing to do with the discount supermarket chain and it is not clear why its author chose to name the bot after Aldi – it is thought it may relate to the bot's discount pricing. Company says "We’ve encountered a bot sale, which, in case it finds followers, can cause a massive glut of malware all over. The so-called “Aldi Bot” first appeared in late August and has been sold for the initial price of €10! Parts of the bot’s code oddly look like ZeuS code…"
The Aldi Bot can read (saved) passwords from the Firefox web browser, Pidgin IM client and JDownloader download tool, and send them to a command and control server which is included in the €10 price tag. The Aldi Bot can also carry out Distributed Denial-of-Service (DDoS) attacks, as the bot's author demonstrates with a YouTube video showing an attack on the German Bundeskriminalamt (equivalent to the UK CID) web site. 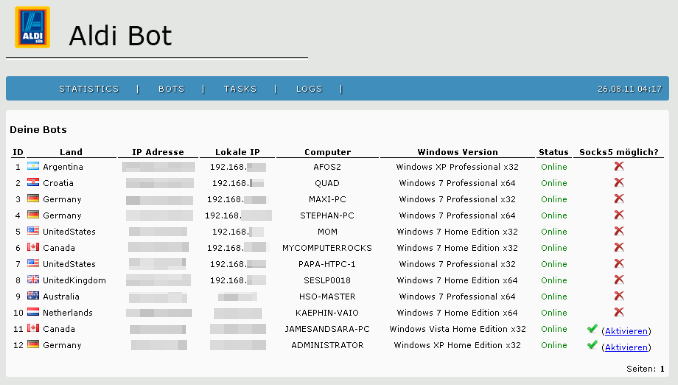 The bot can also be set up as a SOCKS proxy to use infected computers as proxies for protocols of the bot herder's choosing. Infecting systems with the discount malware does, however, require additional measures, such as exploit packs on infected web sites.